Indian celebration is incomplete without flowers, which play a significant role in the Hindu tradition. Flowers serve as a powerful medium of communication to Gods in Hindu concept of spiritualism. While there are various varieties of flowers available in the market, you should know that each Goddess has her own favourite. In Maha Navaratri, offering flowers to nine different Goddesses holds special significance. 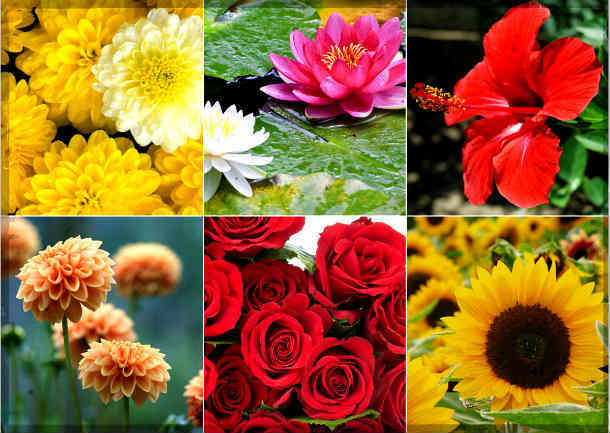 Find out which 9 flowers you should offer to the deities throughout the nine holy days. - Offer either one flower or flowers in the multiples of 9. - Avoid mutilated flowers and offer only fully blossomed ones. - Do not smell the flower that you may be offering to the deities. How Lotus Plays a Significant Role in Maha Navaratri? Lotus is truly one of the most beautiful flowers in the world. This divine bloom is a real delight for the eyes and is the symbol of true soul of an individual. It symbolizes prosperity, beauty and fertility. The Lotus flower happens to be an integral part of various celebrations and is one of the best ways to appease the Goddesses during Navratri as each one of the nine Goddesses has a special connection with Lotus. Goddess Durga is adorned with a garland of lotuses, Goddess Saraswati is associated with the white lotus, whereas Goddess Lakshmi sits on a full-bloomed lotus and holds a lotus in Her right hand. Morever, in Hindu literature, the lotus flower is associated with higher knowledge and greater virtues and is said to represent salvation as well as liberation from the mortal bonds of the material world. This flower is one of the most prominent symbols which represents the Satva Guna. Finding it difficult to drive away negativity? Have you tried various remedies to eliminate negativity and invite positivity, but have not got the desired results? Then, this Navratri, bring home the Maha Sudarshan Yantra - the ultimate tool to generate positive vibrations.